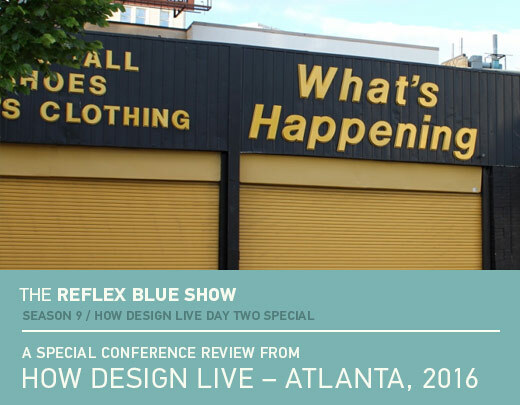 We recap day two of HOW Design Live in Atlanta with Chip Kidd, Erik Hluchan, Hank Richardson, and Jamie Saunders. Enjoy. Rocking it LIVE LIVE LIVE from the show floor — three days ago. Our efforts to bring you the AIGA Make/Think Conference were routed by our shotty server-to-wi-fi connection at the convention center and hotel. Everything else worked great, but when it came to uploading the files, we tasted bitter defeat time and time again. Eventually the stress became to great, and we decided to bring this show back and launch it from the comfort of our own studio chairs. So give it a listen — more shows are coming this week! 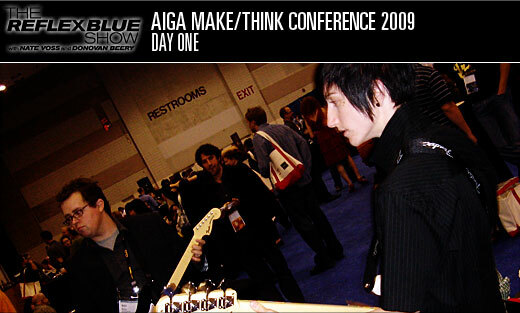 Download The Reflex Blue Show with Nate Voss and Donovan Beery, AIGA Make/Think Special: DAY ONE or click here to subscribe to The Reflex Blue Show from the iTunes Music Store. Welcome back to the as-promised sequel to the last book review,The Learners, once again by Chip Kidd. Not that anyone is going to notice, but please, before you rage-out on us for bestowing this fit and well-groomed celebrity designer’s book less than a perfect 5-star review, give the video a watch. I’ve been told on good authority that our reviews will play directly in-window now (hooray) so everyone thank Donovan for that before telling him how wrong he is. Word. Download Reviews Gone Bad: The Learners (12 meg) or click here to subscribe to Reviews Gone Bad from the iTunes Music Store. Donovan plunges into some oldie-but-goodie books this week, starting with the you-probably need-to-read-just-because-you’re-a-designer Cheese Monkeys by Chip Kidd. D wanted to preface this by saying that it’s a work of fiction, and so he felt like he had to hold it to those standards, which, as a category, also includes these works. So, as before, know your bar. We’ll be back soon with Donovan’s take on Kidd’s sequel, The Learners. Download Reviews Gone Bad: Cheese Monkeys; A Novel In Two Semesters (15 meg) or click here to subscribe to Reviews Gone Bad from the iTunes Music Store. I’m on a short clock today, so I must be brief. First, sorry for today’s horrible art on the strip. Second, this announcement did indeed find its way onto my TweetDeck yesterday, and I’m pretty excited (for him) about it. I think a Chip Kidd-written Batman book could only be described as “a hoot.” Chip can only really be described as the world’s biggest Batman nerd, as well as the King Geek of Design, so this project has to be one of those life-long, dream-come-true situations. I get it: Read books. Read Batman books. Design books. Then design Batman books. Then write books. Then write Batman books. Like Paul Rudd’s character’s line in Knocked Up, “I wish I loved anything as much as my kids love bubbles,” I’m not sure I can relate. This would be like me making a Star Wars movie, Halo game, and X-Men comic all at once. Don’t believe me? Listen to our barely-safe-for-work interview with Chip Kidd and hear for yourself!